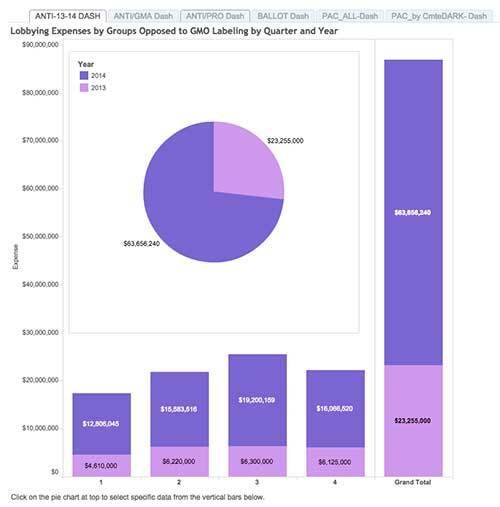 This analysis updates a September 2014 EWG report that found $28.3 million in anti-GMO-labeling lobbying expenditures in the first two quarters of 2014. The burst of anti-label lobbying is aimed in part to muster Congressional support for legislation sponsored by Rep. Mike Pompeo (R-Kan.) that would block state-level GMO labeling efforts, impede moves by the U.S. Food and Drug Administration to require GMO labeling nationwide and codify the current, failed voluntary labeling system. The Pompeo bill, dubbed the DARK (Deny Americans the Right to Know) Act by advocates of GMO labeling, was originally introduced in April 2014. Pompeo reintroduced similar legislation under the same name on March 25 of this year. Last May, Vermont became the first state to enact legislation to require GMO labeling. The Grocery Manufacturers Association and other trade groups filed a lawsuit in an effort to prevent the law from being implemented. If the suit fails, all food made with GMOs that is sold in Vermont must be labeled, effective July 1, 2016. Connecticut and Maine have passed GMO labeling laws that would go into effect if other northeastern states pass similar legislation. State legislators in 30 other states introduced more than 70 labeling bills in 2013 and 2014. The Grocery Manufacturers Association -- one of the DARK Act’s most vocal supporters – disclosed $5.8 million in lobbying expenditures tied to GMO labeling last year, up sharply from $60,000 in 2013. 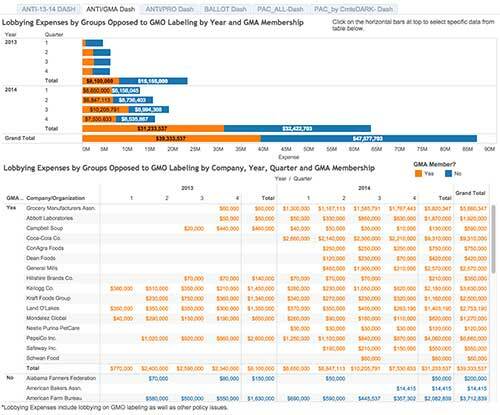 The association’s member organizations separately disclosed another $25.4 million in lobbying expenditures tied to GMO labeling last year. Of that, almost half -- $13.3 million -- came from beverage giants Coca-Cola and PepsiCo. Food and biotechnology industry lobbying dwarfed those by GMO labeling advocates, who disclosed $4.3 million in the last two years -- $1.6 million in 2013 and $2.6 million last year -- to lobby for issues including GMO labeling. It comes down to this: opponents of labeling have already outspent supporters by nearly 20-to-1. With Vermont’s law set to go into effect in 2016, GMO labeling lobbying expenditures in 2015 are expected to continue to climb. Advocates of GMO labeling are supporting legislation introduced by Rep. Peter DeFazio (D-Ore.), and Sens. Barbara Boxer (D-Calif.) and Richard Blumenthal (D-Conn.) that would require GMO labeling nationwide. According to public records, opponents spent a whopping $105.8 million to defeat GMO labeling ballot initiatives in California, Washington, Colorado and Oregon between 2012 and 2014. EWG did not tally funds used to lobby state legislatures. 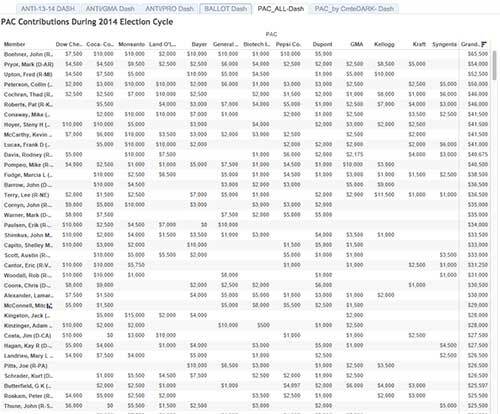 To see how much money flowed from corporations opposed to labeling to office-holders and candidates, EWG looked at big food and biotechnology companies’ Political Action Committee contributions during the 2014 election cycle. 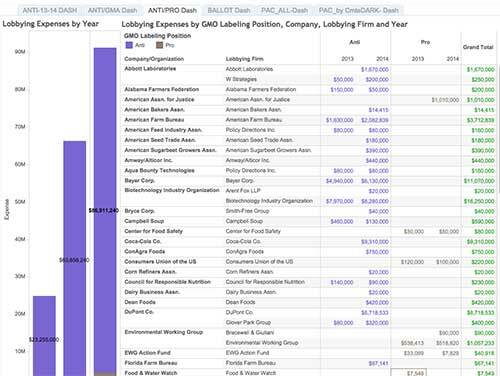 PAC contributions by Bayer, Biotech Industry Org., Coca-Cola, Dow Chemical, DuPont, General Mills, Grocery Manufacturers Association, Kellogg, Kraft, Land O’Lakes, Monsanto, PepsiCo. 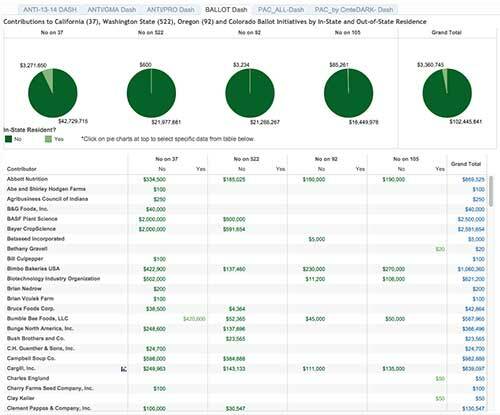 and Syngenta totaled more than $3.8 million to 404 candidates. 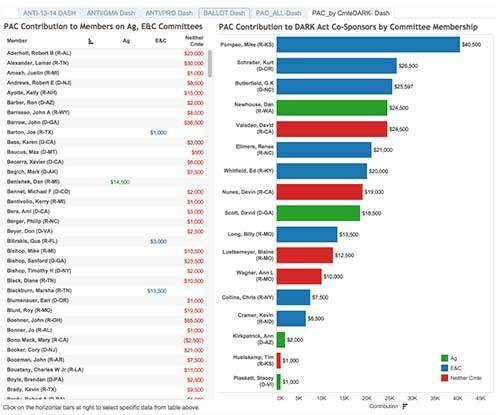 More than $1 million of the PAC contributions documented by EWG went to 79 members of Congress who sit on the House Agriculture or House Energy and Commerce committees, the committees that share jurisdiction of the DARK Act. Pompeo is a member of House Energy and Commerce. Pompeo and 16 other DARK Act co-sponsors received a total of $274,097 in food and biotech PAC contributions. Pompeo and 11 other members of Congress on the House Agriculture or Energy and Commerce committees, received $207,097 of that amount. Pompeo was the largest single beneficiary among DARK Act co-sponsors, receiving $40,500 in contributions. DARK Act supporters often claim that requiring GMO labels will cause consumers to flee food products and force food companies to reformulate their products and raise their prices. But a study by two U.S. Department of Agriculture researchers determined that “labeling has negligible effects on consumer choice” and studies repeatedly find that changing labels has little impact on food prices. Another common DARK Act talking point is that we can’t require mandatory labeling because we need GMOs to feed the world. A recent analysis from EWG showed that we do not need GMOs to feed the world, and that GMO crops in the U.S. are not substantially contributing to global food security. Worse, the World Health Organization recently classified glyphosate, the most widely used herbicide on GMO crops, as “probably carcinogenic to humans.” The use of glyphosate on farmland has skyrocketed since GMO crops were engineered to withstand it, and since then, agricultural use of the herbicide has increased 16-fold. With numbers like that, it is no wonder more than 90 percent of Americans support mandatory GMO labeling. And its no wonder that state legislators have listened to the voters.